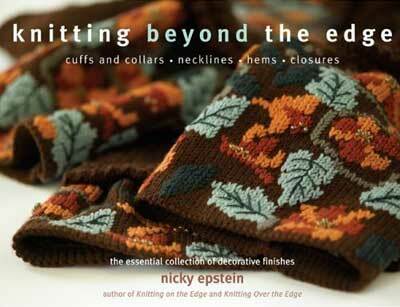 She’s already knitted On and Over the edge—and now Nicky Epstein is going even beyond that! In this third entry in her bestselling series, Epstein shares more than 150 one-of-a-kind adornments for cuffs, collars, angles, corners, and necklines—embellishments for any type of garment edging. With her signature inventiveness, Nicky provides an abundance of ideas and takes stitchers one step further: Whereas the first two books used swatches to illustrate the edgings, these beautiful and elaborate finishings are incorporated right into the actual garment’s design, so it’s easy to see just how they’ll look. They range in difficulty level; some are simple but elegant, others complex and truly extraordinary. There’s a bell-sleeve jacket with a Celtic knot closure; a stylish cable-hooded wrap that’s textured with unusual patterns and bobbles; and a Fair Isle coat in eight different colors of yarn and with an unusual hem treatment and twisted cord embellishment. All are accompanied by detailed instructions and crisp color photography. This essential reference will inspire anyone who loves to knit.